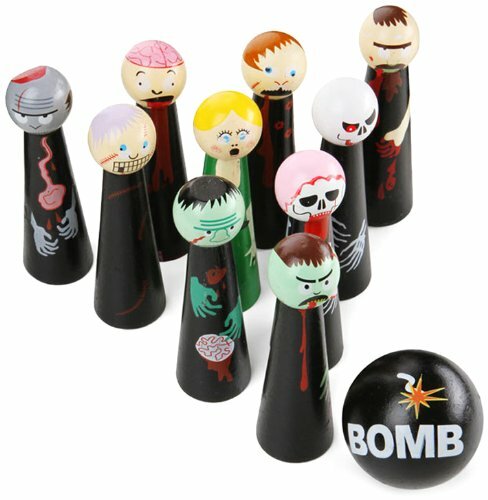 No need to aim-for-the-head with this table-top Zombie Bowling Game. Just aim, roll and then knock over as many of walking dead as you can. Highly addictive zombie fun. The games are built to last a lifetime. The set includes 2 miniature bowling balls and 10 hand-crafted miniature bowling pins 4'' tall, all packed in a convenient storage box. Suitable for 2 or more players over age 3. Front Porch Classics offers "unplugged family entertainment." We're dedicated to bringing people together through play. Our games are designed to engage friends and the whole family around the coffee table, laughing, sharing and building memories. We build our core values into every toy and game we sell: rich storytelling, elegant design, ageless appeal and limitless play.